Made of high strength aluminum alloy, anti-rust, sturdy and durable in use. Two hot shoe mounts on the top can hold both video light and microphone, easy to use. 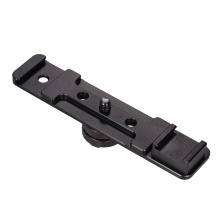 With 1/4 inch screw holes, the extension bar also can be mounted on a tripod or a light stand. Easy to install, lightweight and portable. Offer more possibilities for photographers to take better photos.